Polyurethane on the inside coated by soft 200 denier nylon on the outside and breathable. 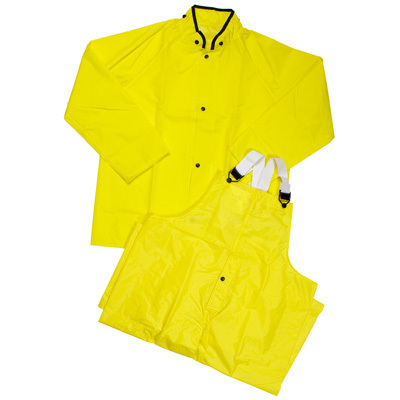 The Eagle is the most lightweight and comfortable raingear Tingley makes! There are similar brands out there but none with the quality and attention to detail that the Eagle offers. • 100% waterproof protection. Raglan sleeve construction and generously cut to wear over the heaviest work clothes. • 4.5 oz material weight, 9 mil thick with stitched and taped seams. Jackets offer a storm fly front to seal out wind and rain. Non-conductive and non-corrosive snaps and buckles. • Premium snap lock suspender buckles with heavy duty straps. • Mildew and flame resistant.